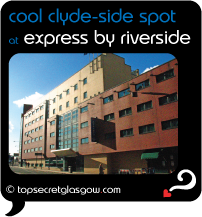 Express by Holiday Inn Glasgow City is on the banks of the river Clyde. A short stroll to the historic Merchant City, and close to several theatres and all the fantastic shopping Glasgow is famous for, this makes a super place to begin exploring Glasgow. All 128 rooms are modern and well decorated. Before you get going, take advantage of the complimentary continental breakfast. Then get out there and have some adventures. There really is so much to see and do in this vibrant city. With so many top restaurants and bars to choose from in the Merchant City and city centre, visitors are in for a treat. Have fun staying here. It's waiting to make your visit to Glasgow a memorable one. Great news! Finding this page means you can now join our VIP list for Express by Holiday Inn Riverside. Grab your very own web page all about Express by Holiday Inn Riverside. Do you have a special story about Express by Holiday Inn Riverside? A funny experience? A grand occasion? A funky photo? A personal tip? A top secret? public Dunlop Street, Stockwell Street (LLP) in the hood! Express by Holiday Inn Riverside has 24 hour front desk service.